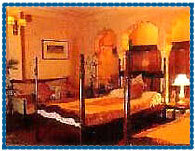 Hotel Samode Haveli Jaipur, Samode Haveli Hotel Jaipur, Reservation for Hotel Samode Haveli, Jaipur, India. 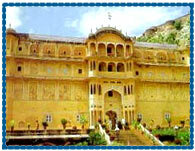 Address: Gangapole, Jaipur, Rajasthan, India. Accessibility: 17 kms. from Airport, 6 kms. from Railway Station, 4 kms. from Bus Stand. Hotel Samode Haveli stands in the heart of the sprawling walled city of Jaipur, giving an ideal location to stay for those who would like to wander out and experience the history of the surrounding monuments and browse in the market places, with unique atmosphere of the contemporary and the historic ambience, offering a warm & friendly atmosphere with personalised service. Hotel offers 22 well appointed rooms and suites designed and furnished with genuine antiques and fixtures, old family portraits with a separate dressing area. All the rooms are equipped with ensuite bathrooms with shower and tub with hot and cold water, air conditioning, television with cable connection, telephones with international dialing facilities. Banquet & Conference Facility, Open Air Swimming Pool, Jacuzzi, Wading Pool for Children, Steam Room, Ayurvedic Massage Centre, Pool Side Bar, Golf, Laundry, Gift Shop, Safely Vaults, Car Park, Currency Exchange, Room Service, Doctor on Call. American, Master and Visa Cards Accepted.